In the first six months of Open Lab Idaho's life, we've seen plenty of activity, and we are finding our community lots of fun projects to do. There are plenty of things we do on a regular basis. From robots to art and maker meetups, OLI is full steam ahead. Below we've got a few of our favorite projects that have been making lots of really cool progress over the last few months. Telepresence Robotics- Local robotics enthusiast Dan Ray has been kind enough to take a few of the OLI members under his wing and teach us some practical lessons on making robots that are controllable remotely. Using Arduino, hacked Roombas and a couple cool tricks, we've been able to create a team of robots that can be driven via the internet. Some of us have even started thinking about making robots that could simulate rovers that perform scientific tasks. 3D printing with powder- Our allies Reuseum Educational had a ZCorp 3D printer donated and it needs a big overhaul. So far, OLI members have cleaned and retrofitted the machine to be able to print with experimental materials, and are in the final stages of hacking to get the printer working. 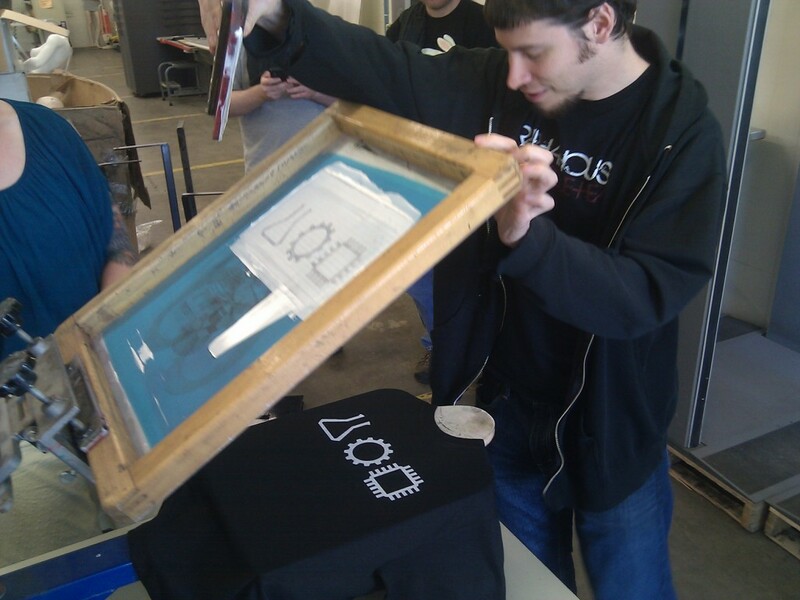 Screen printing- We are the first to admit that the current membership is mainly comprised of individuals with tech backgrounds, and that makes it easy to wow ourselves with skills from forms of art that we don't normally expose ourselves to. 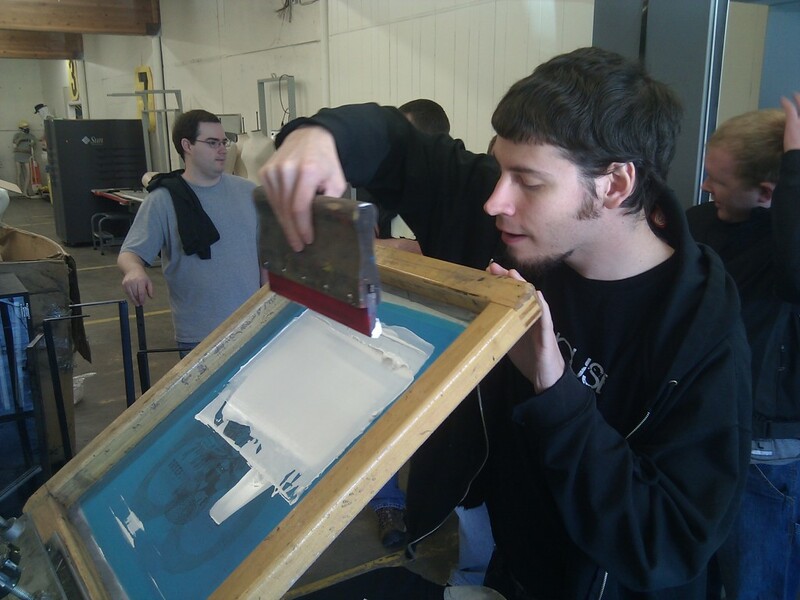 We've already had a couple workshops and demos with local screenprinting gurus Inkpony, and the Design Bandits, and in the near future plan to have them back for an all out barrage of screenprinting and tech madness... stay tuned. Raising Makers Club- Given that we have a lot of fun stuff that we've done, one of our biggest duties is the share that, and so members of OLI and Reuseum Ed. have undertaken the task of introducing young inventors and artists to new ways of making things and seeing their ideas through. Our next meeting is listed on Reuseum's Events Calendar and will be a blast... literally. With all of these major projects underway, and a plethora more residing on our forums, working towards building our room to house machines and tools is also a big priority. As soon as this fall, we hope to be comfortably housed with enough work areas for study and tabletop stuff combined with room for tools and fabrication machines. Stay tuned and don't blink, you might miss something! On Saturday July 14th, from 4pm to 10pm, The Reuseum is inviting the public to an open house style making and creating event. Naturally, we are stoked! Demonstrations currently include exhibits such as live silk screening demos and activities by the Design Bandits, Lego bot building presented by the Bots of Prey team, robots that build and make things by Open Lab Idaho, and other locals that are passionate about their art. Earlier in the morning, our Raising Makers Club will be hosting an introductory session for kids who would like to learn about 3D printing and desktop fabrication. There will also be family friendly crafts with tools to take stuff apart, raffles, and contests! Payette Brewing will be pouring the delicious brew that they make as well. So prepare for quite a block party as we create and have fun! And remember, this isn't just robots and science. We have over 18 categories of making that ranges from Food & Farming, Human Performances, Fabrication and Industrial Arts, Music, and robots of course! Check out the official announcement to make sure I got all the details right! See you there! We know that this is very short notice, but Open Lab Idaho is meeting at the space on Thursday, June 27th to clean and set up our donated Z Corp 3D printer! We've seen some beautiful prints from this machine, and everyone is anxious to put it to work in the community. The plan is to meet up at noon. As always, bring your projects, whatever they are! Saturday June 9th, The Telepresence Robotics Workshop taught by Dan Ray will be held from 12-3 pm. This will be a hands-on workshop in which we build a robot using an Arduino (or compatible) microcontroller, hacked roomba, and small netbooks or laptops (user provided) to call in from Skype and drive around! The cost for a kit to take home is $44.99, if you have your own Arduino then the cost is $24.99 ( motor drivers, wires etc). In order to make the perfect robot for you, you will need to find a battery power source, and motors that fit your specific needs, or you can buy one of our hacked roombas after the workshop. This should be a fun one, we hope you can make it! You can show up the day of, or register with the Reuseum online. Check the link for further info! Andy has offered to host a RepRap meetup on Tuesday, June 5th. He'll be giving a primer on OpenSCAD 3d modeling software. Feel free to come in early and setup your gear if you are planning on bringing a bot to build or work on, Andy plans to start at 6:30 pm. See you there! 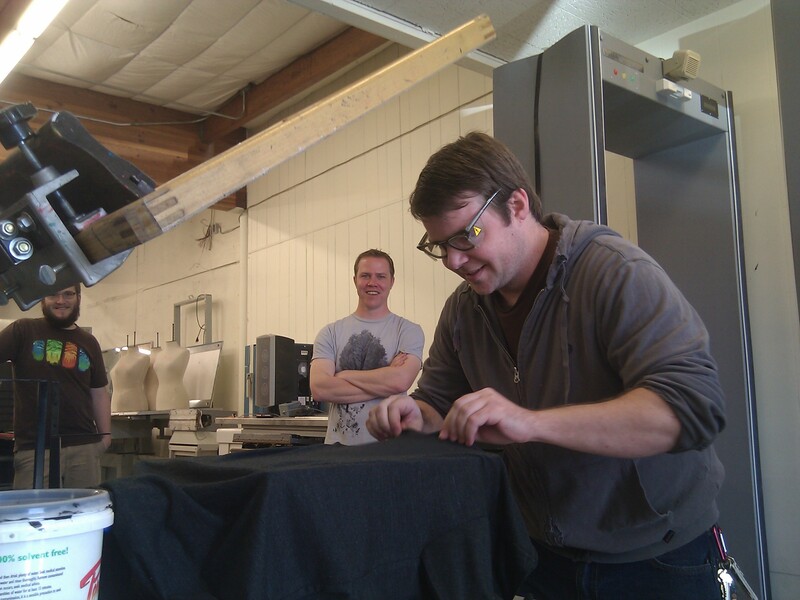 It's official: Open Lab Idaho members are now rocking stylish custom screen-printed t-shirts, thanks to Juliana from Bricolage! We wanted Open Lab Idaho t-shirts, but decided that sending our logo off to have them commercially printed just wasn't the hackerspace way, so Dave invited Juliana down to teach us how to screen print our own shirts. After receiving a copy of our logo, she prepared the screen and brought all of her gear down to show us the rest. Details after the break! Step 1. Position the shirt for printing. This part is tough because you have to eyeball it. We shot for printing the logo 4 inches down from the neckline. 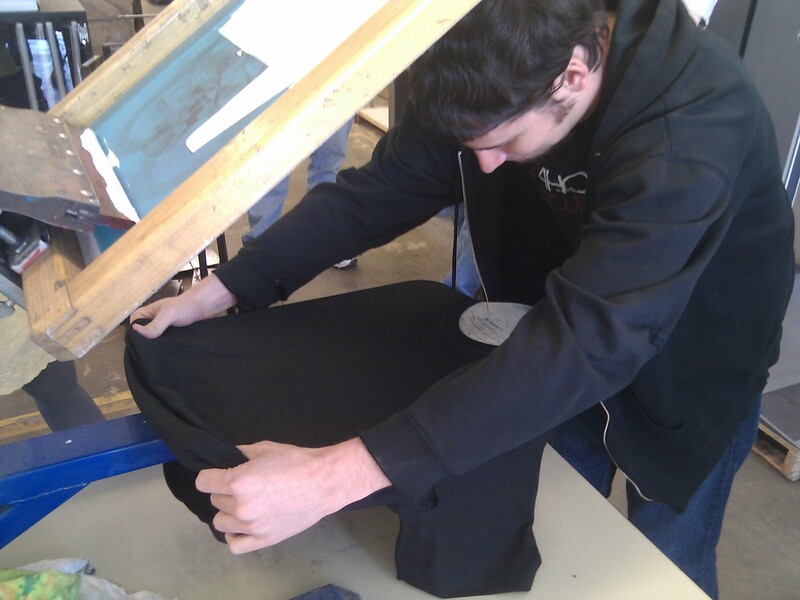 A mild adhesive spray is used to tack the shirt down, just in case a reprint is needed. Step 2. Flood or "recharge" the screen. 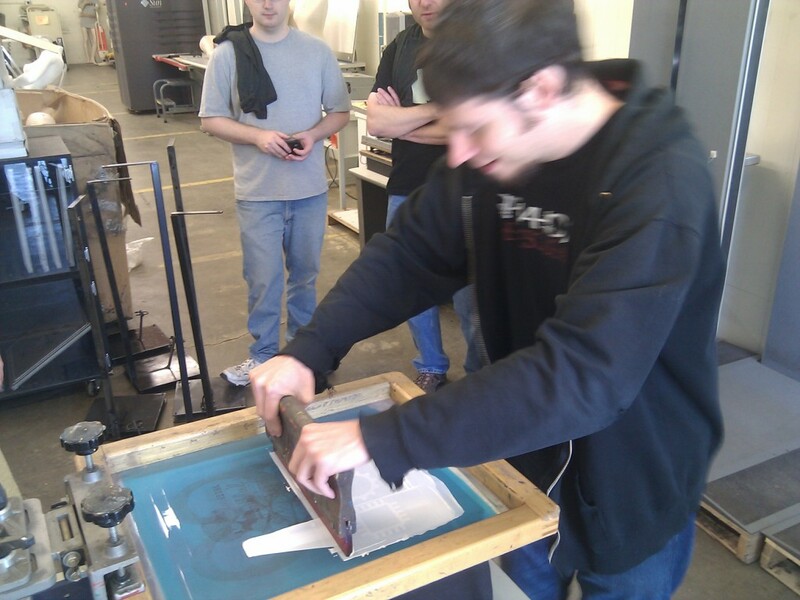 Mild pressure at a 15 degree angle is used to move the ink into the screen for printing. Step 3. Pull the screen down to the shirt. Use moderate pressure with only a couple of degrees on the squeegee, and pull the ink across the logo. Step 4. The moment of truth! Pick up the screen and see how it looks. If needed, reflood the screen and reprint, or leave the print partially unfilled for the distressed look. Step 5. Hang the shirt up for a few minutes. Ours sat for about 20 minutes before we moved on to curing. Step 6. Cure the ink. Use a clothes iron to apply direct heat to the print for about 20 seconds. Each member that could make it down printed off their own shirt, and then took turns printing for the members that couldn't make it. During the course of the workshop, our electronically-minded members noted how similar screen printing t-shirts is to printing "PCBs," or printed circuit boards. This workshop was blast, because it gave Open Lab members a chance to move outside of the usual electronics projects and into the unknown. We would love to see more workshops and projects like this in the future, because we love anything DIY! Several of us expressed interest in building our own screen press for use by Open Lab members, so keep an eye out for that project, and eventually more t-shirts! Many thanks to Juliana for putting the workshop on for us, and teaching us the history and practice of screen printing! On Sunday, April 29 one half of the talented ladies of Bricolage have agreed to teach anyone willing to screenprint a design onto a t-shirt. We'll be using this as an excuse to have members make their own Open Lab Idaho t-shirts, but Juliana will also have some of her great designs on hand to screen as well. Come down and get your hands dirty! This workshop is open to the public from 12pm- 3pm, and the cost is $25, extra shirts are $15. We'll be screening from 12-3pm! Open Lab Idaho forges ahead at it's second official monthly meetup! Many members showed up early in the afternoon, and stayed until very late in the evening. The board got more details ironed out, and some basic network infrastructure was planned and installed. We saw projects of all types, from drip-irrigation systems to bi-pedal walkers built with 3D printed parts. Also present were a couple of Linux projects, a controller adapter for MAME in an NES console, a giant 3D printer that had to be delivered in a pickup, as well as a homebuilt multi-touch surface. We are looking forward to seeing your project at Open Lab Idaho next month, no matter what it is! Check out all of the pictures after the break! Come one and come all, and don't forget to bring your projects and ideas! We'll be meeting up in our new space at 110 W. 33rd St. in Garden City, next to the Reuseum all day and into the evening! If you are interested in what we do, and would like to come down, then by all means, please stop by! Typical projects are not so typical at the Open Lab, anything from DIY craft and soapmaking to the creation of robots and dueling servers are up in the near future. Please feel free and come join the fun as we build and talk about our ideas! I am pleased to announce that the board and executive teams have chosen an official Open Lab Idaho logo! Originally, we had not defined how the logo would be chosen, but Dave sent out a call to our members, asking for logo ideas. We received nothing less than an overwhelming response; 40 logos to choose from! Several logos saw quite an evolution as different members modified and added to existing designs. A few weeks ago, the board decided to vote internally on the logo submissions, and choose the best three for a vote by the membership. We ended up narrowing 40 logos down to 4, and began discussing the pros and cons of each. It quickly became clear that while all four were great options, one in particular met widespread approval by the board and executive teams, in addition to individual members in personal queries. The board and executive teams also wished to reduce the amount of time spent in flux with no logo, prompting them to select an official logo by majority vote. Read on after the break! We chose the official logo for several reasons. 1. Crowdsourced. Many Open Lab Idaho members contributed ideas and design work to this logo. It represents the work of a large part of the OLI membership. 2. Modular. This selection isn't just a logo, it's a family of modular logos that can be rearranged and reworked, depending on the application. While we will have a core official logo, we found that this family of logos (See below) would grant OLI members the ability to modify the logo, based on where it will be used. Derivative works, interpretations, and 3D prints are inevitable! 3. Communicates. This logo family effectively communicates that we work on mechanical (gear) and electronic (chip) projects, in a scientific and innovative atmosphere (flask). The flask could also represent chemical projects when OLI travels that road. I personally tested the 3-Logo variant outside of OLI, and found that people immediately understood OLI's purpose after seeing the logo. 4. Professional and Timeless. The official logo is equally as professional and timeless as logos from successful companies and organizations such as Nike, Apple, Ubuntu, and Aperture Science. It isn't trendy, and should remain pleasing in appearance for years to come. 5. Clean and Simple. This logo looks great in large and small applications. It is simple enough to embroider on a polo shirt, shrink to the size of a dime, or print in simple black and white. It is also has no orphaned pieces, which will make vinyl cutting and 3D printing much easier. The board and executive teams would like to extend their gratitude to everyone who submitted ideas and designs for this project. We will always be needing artwork for posters and announcements, and many of the logos submitted would work perfectly for such applications. Even if your logo wasn't selected, we will most certainly need it in the future. If you have any questions, feel free to contact me (FuelCell250) via personal message on the forums. If desired, I will be more than happy to relay your messages to the board and executive teams. Official logo files will be made available in PNG and SVG vectored formats shortly. Thanks again Open Lab Idaho!